It’ll be a busy two weeks at the PBS 106.7 office when the 2015 Radio Festival kicks off. The festival is the one time of the year when PBS implores the community to support the station financially; a support that – if big enough – will keep PBS afloat for the next 12 months. The PBS Radio Festival gives listeners the opportunity to fight for the station they love — a station independent of corporate control. For two weeks of the year PBS sets up a buzzing phone room filled with catering, coffee and volunteers. “It kind of feels like a rolling house warming party that never gets to that bleeding edge seedy end of the night — awesome volunteers working the phones and mail outs, heaps of musicians coming in to love up the station, presenters hopping on board each other’s shows, the hard-working PBS staff focused on keeping everything together… it’s pretty amazing,” enthuses presenter Jennifer Kingwell. So how does it work? Listeners can either sign up or renew their existing membership with PBS; a membership that enables them cheaper access to different events across the year; discounts; a 12-month subscription to PBS’ Easey magazine, plus other incentives. Major prizes for listeners that sign up during the festival include a brand new, classic red Vespa PX 150 scooter and a Maton W.A May custom guitar. Memberships range in price and incentives depending on the level you choose — the cheapest being a concession membership for $40. Since December 1979 PBS has been pivotal in fostering and promoting local and international music. A social hub for musicians, presenters and general music aficionados PBS has also been fundamental in promoting the Melbourne live music scene; curating gigs, announcing daily shows and interviewing various musicians and industry folk. A community-run radio station PBS has always relied on listener support for the lion’s share of its income. “The objective of radio festival is to raise the majority of funds that will keep PBS going through the year. The station has a small full-time paid staff who are essential to the operation, plus there are the utility bills, maintenance of equipment such as microphones, computers and broadcast equipment. There’s also our broadcast licence. It’s a big operation and we rely on public support so we can remain 100% independent,” explains fellow PBS presenter Adam Rudegeair. 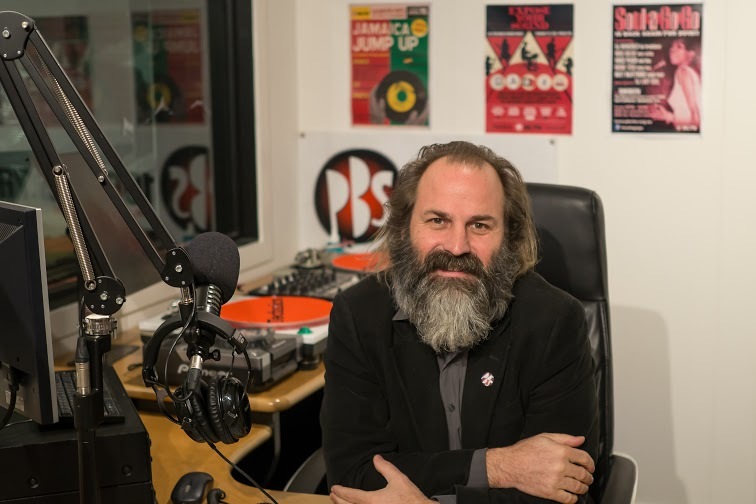 “Public support is not only a financial necessity for us; it’s the reason we’re here: to bring you a fantastic and diverse explosion of under-represented music from around the world that wasn’t paid for by a corporation,” Rudegeair adds. “Another time a guy called up from Afghanistan — he was in the army and he must have been streaming us live from a satellite thing. He wanted to support the station and sign up while he was on service,” Basso laughs. Help keep PBS 106.7 afloat for another 12 months by calling 8415 1067 or signing up here. During the Festival, the phone lines will be open from 6am – midnight seven days a week. ← WALK DON’T RUN…TO YOUR NEW SUPER FOOD CAFE!